Listed at the end of 2007, Ascendas REIT (A-REIT) is the largest Industrial REIT listed on the SGX in terms of market capitalisation. It has 145 industrial properties from logistics spaces to Business Parks that house a diverse range of industries and companies. 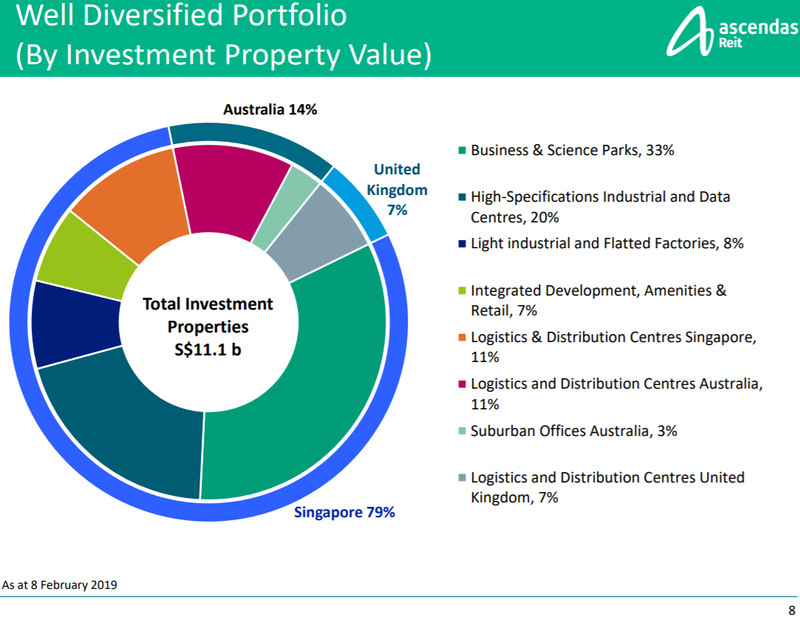 A-REIT’s properties are located in the UK, Australia and Singapore, though a large majority of its investment properties (in property value terms) are located in Singapore. In the first of a 2-part analysis of A-REIT, we analyse how A-REIT fits (or not) the market trends taking place for Industrial properties in the Singapore market. The main source of revenue for a REIT is the rental income it receives. Thus, it is important for a REIT to have a track record of growing gross rental income q-o-q/y-o-y, and to ensure that it maintains a consistent increase in gross rental income going forward. For an industrial REIT like Ascendas REIT, the various types of industrial spaces they operate in can be categorised into 4 main areas - Business and Science parks, Hi-Specs Industrials, Light Industrial and Logistics. Business Parks and Hi-Specs Industrials usually engage in more capital intensive business-oriented activities which are high-tech and are more R&D focused. They typically house MNCs and large Singaporean firms. On the other hand, Light Industrials and Logistics spaces are usually less capital-intensive as they typically produce smaller consumer goods. Thus, as Business Parks and Hi-Specs industrial spaces house more complex industrial operations to larger firms, they command a higher rental rate than Light Industrial and Logistics Spaces. A-REIT’s property portfolio is well positioned to take advantage of the higher rental rates Business Parks and Hi-Specs Industrials offers. 53% of its investment properties’ value are made up of Business Parks and Hi-Specs Industrials. We contrast this figure with other SGX-listed Industrial REITs - 52.1% for Mapletree Industrial Trust and 28.5% for AIMS AMP REIT. But as investors, we always seek growth in the stocks we invest in. It would be fruitless to invest in A-REIT if rental rates of Business Parks grow slower compared to other Industrial spaces. In such a scenario, it would be better to invest in Industrial REITs with a greater portion of Light Industrials and Warehouses in its portfolio of properties. 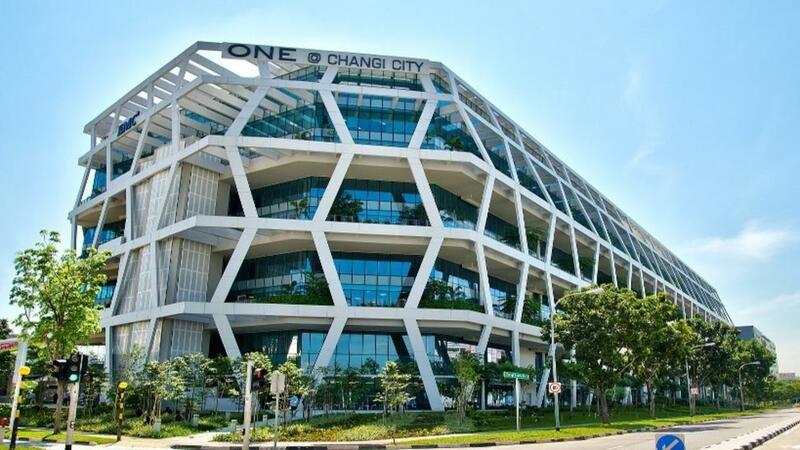 However, as the annual supply of Industrial spaces in Singapore is expected to tighten, this is especially so for the Business Park industrial space. 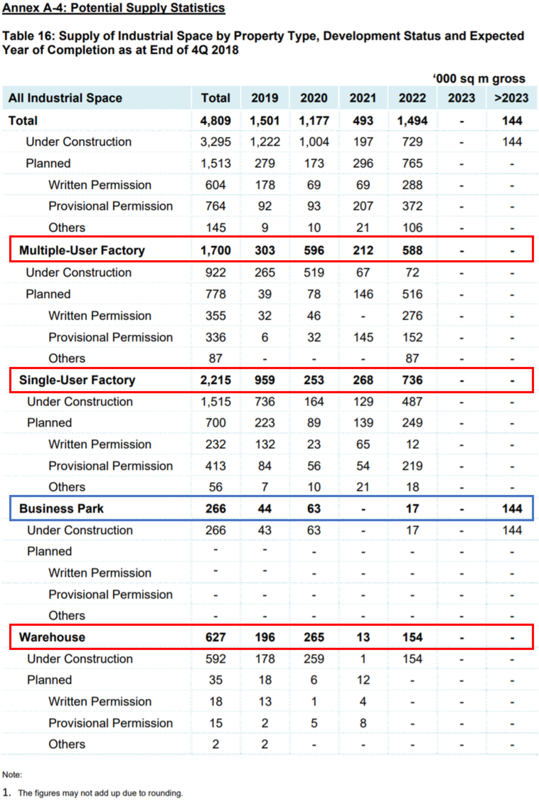 When the upcoming supply of Business Parks in the next 4 years (in area) is compared to the existing supply of Business Parks (in area) in a percentage form, this figure pales in comparison to that of the other types of Industrial spaces - Multiple-user factory, Single-user factory and Warehouses. As the supply of Business Parks tightens to a larger extent compared to the supply of other Industrial spaces, we can expect the rental rates of Business Parks to increase to a larger extent as well. Note: It’s important not to look at the above supply figures of Industrial spaces in its absolute form. It should be viewed in a relative form - so one way is to compare the upcoming supply of the specific Industrial space (by area) with the existing supply of the specific type of Industrial space (by area), as proposed in the preceding paragraph. This allows for reliable comparison across different types of Industrial spaces viz the extent of its future supply. In assessing the future rental rates of Business Parks and other Industrial spaces, we need to analyse the demand side of the picture too. Singapore’s industrial sector has been experiencing pressure from both regional competition and domestic restructuring. Following this, the Singapore government has highlighted the need to revamp its manufacturing model into one that offers more innovation-based and high-value added production. The government’s push towards advanced manufacturing will see firms shift towards more hi-tech developments and manufacturing processes with the adoption of technologies like 3D printing and augmented reality. In a 2016 web article, Singapore’s Future Economy Council estimates that the shift towards Industry 4.0 “may take 20 years to reach fruition” while “key advances are expected to be established in the next five to 10 years”. This will see an increase in demand for Business Parks and Hi-Specs Industrials, which support such capital-intensive capabilities the Singapore government is striving towards in Singapore’s manufacturing sector. Amidst the tightening supply of Industrial spaces, it is not surprising to see A-REIT posting positive rental reversions across most of its Industrial spaces. The latest long haul push towards Industry 4.0 has also provided a recent spark in the rental reversions for Business Parks – Amongst all types of Industrial spaces A-REIT has in its portfolio, Business Parks clocked the one of the highest rental reversion figures in percentage point terms for 2Q and 3Q FY18/19 (boxed in red). We posit that A-REIT is well placed to reap the benefits taking place in the Business and Science Park industrial spaces. It is well positioned to ride the positive trends of the Industrial property sector in Singapore. However, it would be reckless of us to invest in A-REIT solely based on analyzing industry market trends. There are other pressing questions to ask ourselves: How well is A-REIT managed? Is it reaping financial returns for its investors? Is A-REIT in good financial health overall? These are thoughts that need to be considered before making a more informed decision to invest in A-REIT. Hence, in the second part of analyzing A-REIT, we delve deeper into A-REIT’s financials and analyse their latest financial results. Stay tuned for it!